The Bold Type (started July 11, 2017 on Freeform), inspired by the life of Joanna Coles, chief content officer of Hearst Magazines, reveals a glimpse into the “outrageous” lives and loves of those responsible for the global women’s magazine Scarlet. The rising generation of Scarlet women leans on one another as they find their own voices in a sea of intimidating leaders. Together they explore sexuality, identity, love and fashion. 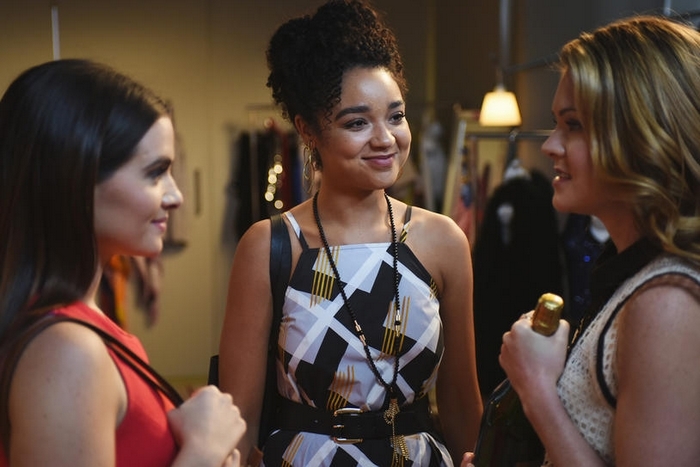 The series stars Katie Stevens, Aisha Dee, Meghann Fahy, Sam Page, Matt Ward and Melora Hardin as Jacqueline, editor in chief of Scarlet Magazine. This scene of Adena and Kat is from the pilot: Season 1, Episode 1.